william.gaston1055 has no other items for sale. Tyco White & RED HO Scale Night Glow Corvette Slot Car LOOK! NICE! 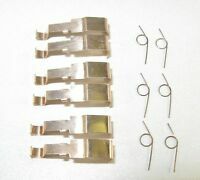 HO Slot Car Parts - Tyco 440 / 440x2 Pickup Shoe Lot of 3 sets - Brand New !!! Sales tax may apply when shipping to: IA*, MN*, WA*, WV (6.0%).